How Can You File for Bankruptcy in New York if You Can’t Afford to Pay a Bankruptcy Lawyer? Chapter 7 bankruptcy is the most common type of personal bankruptcy and is used to wipe out most types of debts (with certain exceptions). But, what do you do when you have serious creditor problems, such as collection calls, collection lawsuits, and/or wage garnishments, but can’t afford to file a chapter 7 bankruptcy? 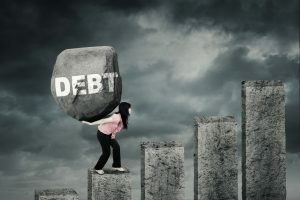 Do you end up like the person in the image above struggling to try to carry a huge debt burden with no end in sight? Thankfully, there is a solution. As pointed out in an interesting article that appeared in ProPublica by Paul Kiel, a challenge people face is they want to file bankruptcy but lack money to hire a bankruptcy attorney. The article points out that in the southern part of U.S. more people file 13 bankruptcy than in other parts of the country because in chapter 13 bankruptcy they can pay the bankruptcy attorneys’ fees off over time out of their earnings. Chapter 13 bankruptcy has been covered in previous blog posts here. At Starr & Starr, PLLC we typically use chapter 13 bankruptcy to help people in New York City (Manhattan, Bronx, Queens, Brooklyn and Staten Island), Westchester, Nassau and Suffolk Counties save their homes, catch up on back rent, and/or catch up with car payments. However, we have some clients who want and need to file bankruptcy but don’t have enough money to pay the fees and costs associated with a Chapter 7 bankruptcy, even if we give them a pre-filing installment plan with payments over time. For those clients chapter 13 bankruptcy can be a way to allow them to file now and pay the attorneys’ fees over time out of their earnings through their chapter 13 plan. This can be particularly useful for clients whose bank accounts are frozen or have a pending wage garnishment (which stops once the bankruptcy is filed). Trustee will Accept Payment Electronically. The new Chapter 13 Trustee will accept electronic payments through TFS Bill Pay. You can sign up for this at https://www.tfsbillpay.com. We strongly suggest that all our Chapter 13 bankruptcy clients sign up for this. It will make their lives easier. Many of our clients and prospective clients in Manhattan, Bronx, Queens and other boroughs are facing the difficult situation of a wage garnishment and wonder if a personal bankruptcy filing could help. Just to review, a creditor with a judgment can garnish the defendant/judgment debtor’s wages. The law permits up to 25% of a judgment debtor’s wages to be garnished in any pay period, not exceeding 10% per year,. Immediately upon filing a personal bankruptcy petition the automatic stay goes into effect. Will the Bankruptcy Court Approve my Bankruptcy in New York? A common question we get from our clients and prospective clients in Manhattan, Bronx, Brooklyn and adjacent counties is if the Bankruptcy Court/Bankruptcy Judge will “approve their case”. In a typical personal bankruptcy case you will not encounter a bankruptcy judge. There will not be a hearing held in the Bankruptcy Court for the Judge to evaluate your bankruptcy petition and approve it or deny it. In the typical non-business consumer bankruptcy case your only personal contact with the “bankruptcy system” will be at the meeting of creditors at which the chapter 7 trustee or chapter 13 trustee (depending on which chapter of bankruptcy you file) will ask you questions about your income, assets, debts and financial history. However, the trustee is not a bankruptcy judge. He or she does not have the power to “approve” or “disapprove” your case. A denial of discharge or dismissal of a personal bankruptcy case can only be done by a bankruptcy judge. However, a trustee can bring a motion seeking to deny discharge or dismiss a bankruptcy case in appropriate cases. Do I get to keep my home in New York in bankruptcy? Whether a debtor gets to keep his or home in a bankruptcy case depends on a number of factors, such as whether or not there is equity in the house, how much of a homestead exemption the debtor is able to claim, if there is a mortgage — whether the debtor is current with mortgage payments to the lender or not, and finally what chapter of bankruptcy the debtor files (i.e., Chapter 7 or Chapter 13).